In the modern era, the percentage of nonpayers began to climb significantly after the Tax Reform Act of 1986, which increased the value of the standard deduction and nearly doubled the size of the personal exemption. In the 25 years since then, the percentage of nonpayers has doubled thanks to the expansion of the Earned Income Tax Credit and the enactment of a plethora of new credits, such as the child credit and the more recent Making Work Pay Credit. 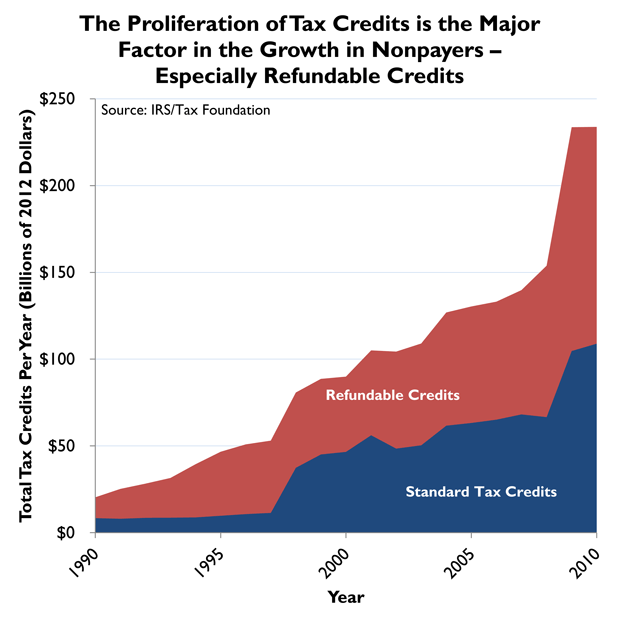 In 2010, tax credits had a combined budgetary cost of $224 billion. Half of these costs were refundable cash payments to nonpayers.